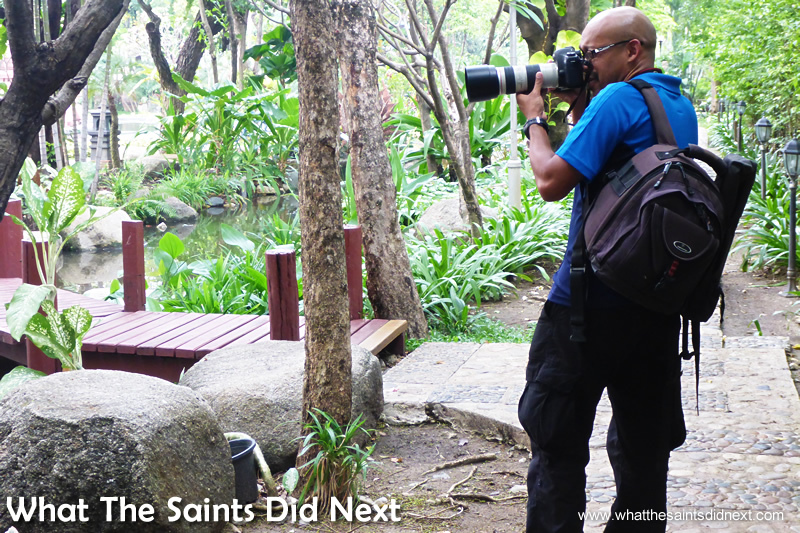 Shooting in the gardens of the Erawan Museum, Bangkok, Thailand. 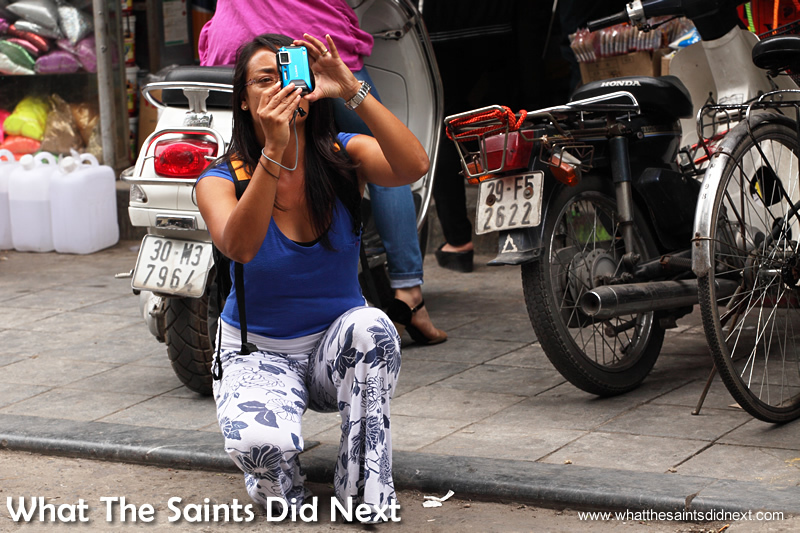 Losing weight quickly becomes a number one priority for travel photographers. No, I’m not talking body fat, although individuals may gauge personal relevance; no, it’s the weight of your kit. Travel by definition involves mobility, and obviously the lighter you can travel the easier it should be. Just as important is expense. Travelling by plane especially there are weight restrictions on checked baggage with additional charges for excess. Arriving at Bangkok’s Don Muang airport, in Thailand for our flight to Cambodia. The big camera bag is on top of the pile. Despite many years experience with a camera, my first proper dip into the world of travel photography took place earlier this year when Sharon and I decided to take a photography trip; three countries in Southeast Asia over six weeks. Immediately the weight issue kicked in! I’m always fascinated by what other photographers pack for such a trip, so bearing that in mind, in this post I’ll share the reasons behind my own packing list. Underpants vs Camera Gear – What Do You Need The Most? What do I definitely need? What would be useful if I can squeeze it in? Our destinations were Thailand, Cambodia and Vietnam. 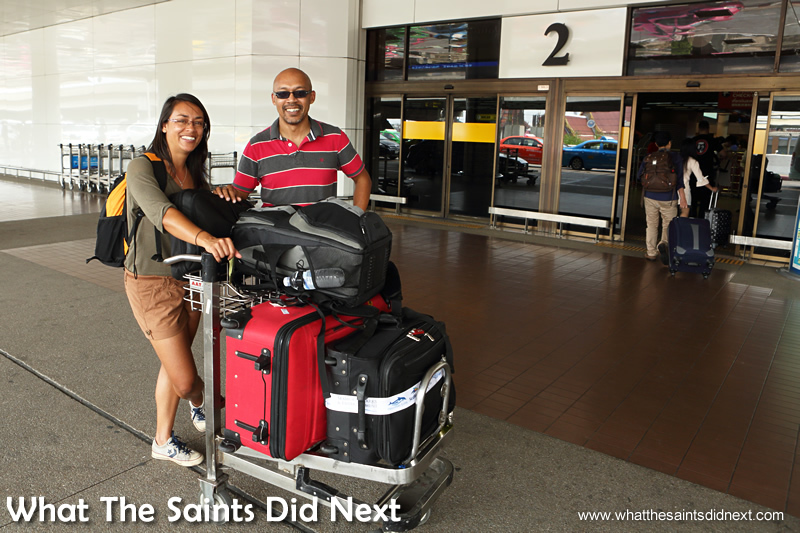 We wanted to travel as light as possible, but photography kit is heavy, plus on a six week trip you need a toothbrush and a few other personal effects. Luckily I’m able to save weight on hair products. Both Sharon and I had never been to Asia before so we wanted to get the balance right. This is how we decided on what camera kit to pack and how effective it was. We’ve always had two cameras, but normally the only time we’ve used both together have been weddings or special projects. When we’re out and about generally we tend to keep one camera in the bag; it can be a bit overpowering for other people when both of us are snapping away. Even so, we decided to take both cameras; the trip was too big to have it spoiled by faulty camera kit. 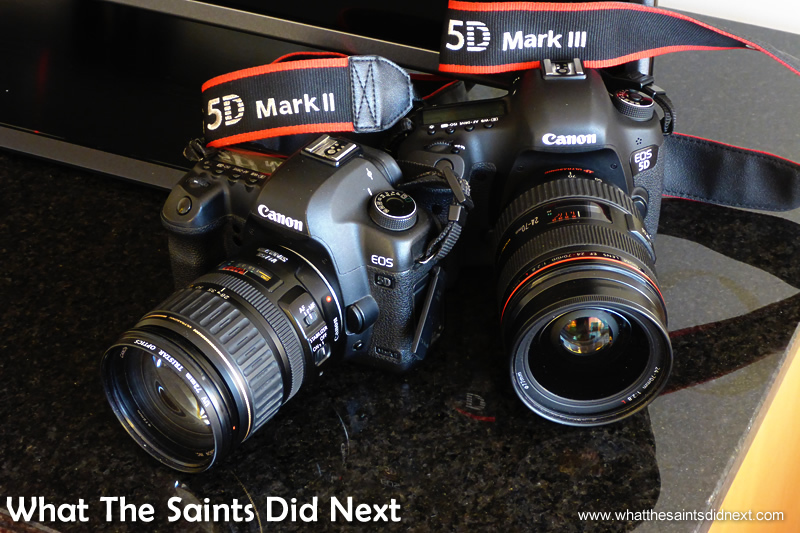 Our two cameras, Canon 5D-MKII and 5D-MKIII. 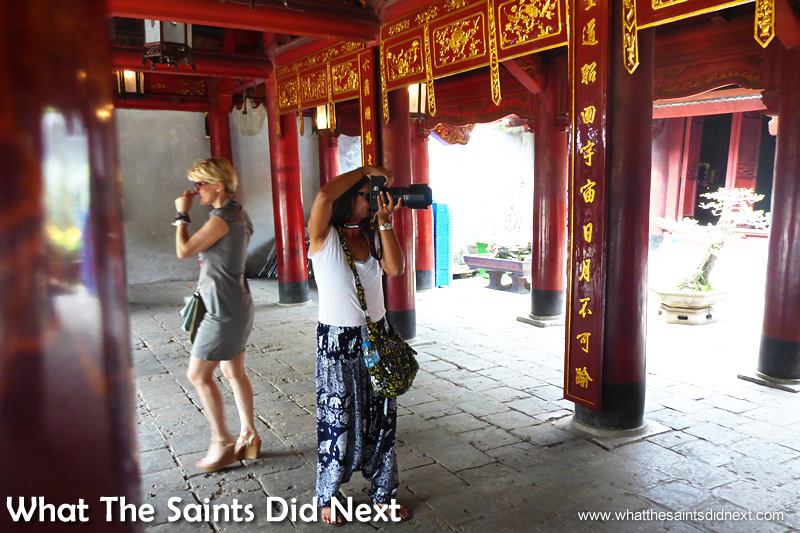 Sharon using the 5D-MKII, shooting inside the Temple of Literature, in Hanoi, Vietnam. Our main camera is the Canon EOS 5D Mark III – SLR Digital Camera (Body only) . The second camera is its older brother, the 5D MKII. (you say it as: 5, D, mark two) The camera bodies with batteries loaded weigh 0.95kg each. 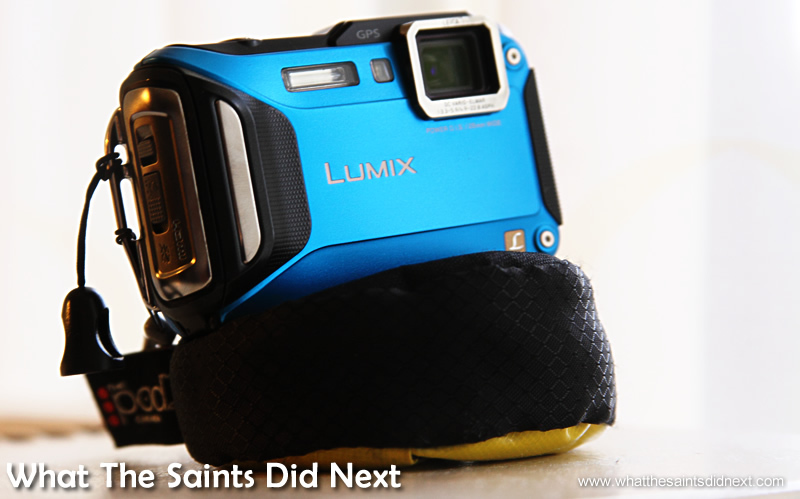 For a comprehensive look at choosing the best travel camera to suit you click here. Effectiveness: As expected, we only ever used one camera at a time, and as expected, both performed flawlessly. But I still wouldn’t do an important travel trip, or any important photo assignment, with one camera body; it’s too much of a risk. 24-70mm, 0.805kg – My favourite lens, ever. It is so versatile in close quarters with its wide angle capability, which is what we’ve needed getting in close for intimate pictures of people. The 70mm zoom gives that little extra scope with framing. 70-200mm, 0.76kg – This telephoto is also a great portrait lens and is always in the bag. It was super handy for the modelling photoshoots in all three countries. 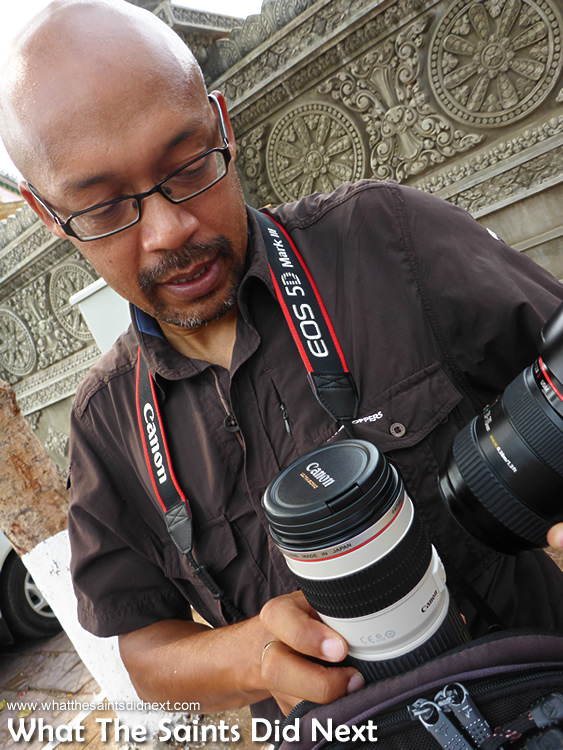 Changing lenses in Phnom Penh, Cambodia. Not sure why I look so confused! 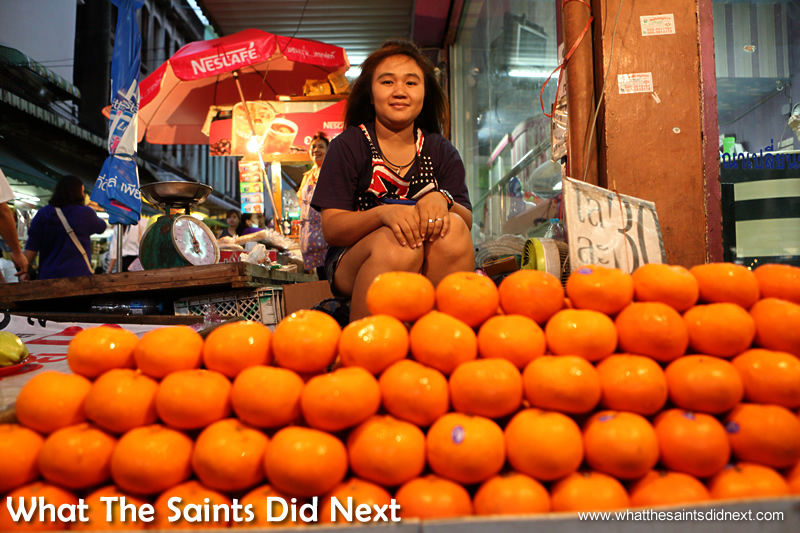 The wide angle of the 24-70mm lens was perfect for capturing this little girl helping out on a fruit stall in Bangkok. In addition I packed the 28-135mm (0.54kg) as a backup lens. All three lenses are Canon brands. At the last minute I decided to leave the macro behind. This was a good decision as there have only been a few occasions I’ve missed it, mostly with flowers. Effectiveness: The main two lenses were used regularly and were perfect choices. This was no surprise as I use them all the time. The backup lens was used once or twice just to give it an outing! This was a difficult one. I knew I wanted to do modelling shoots in as many countries as possible, and strobes on location give extra lighting control to the shoots. Normally I like to use at least four, but considering weight, I decided to make do with two. The Yongnuo fitted on the camera and the Canon flash on its stand. The Yongnuo being used as a back light on our shoot with Tanya. It is mounted on the tripod. 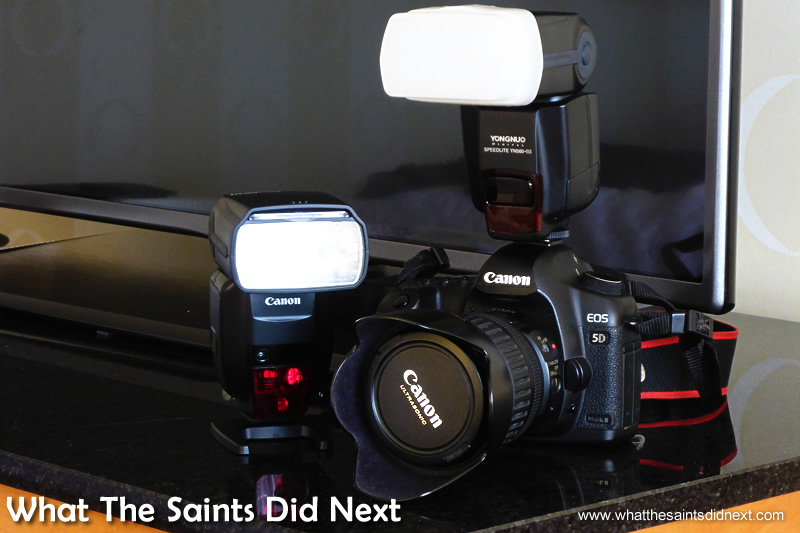 The strobes were almost a luxury item, as most of our travel photography didn’t require flash. However, I’m used to always carrying a flash every day because at times it can really bring an ordinary shot to life if you are confident using it. For instance this shot (below) of a cycle policeman in Chiang Mai, Thailand; it was late in the evening, we were in the shadow of a temple but the cloud formation above looked great. I quickly fitted the flash, balanced the ambient light and managed to capture this shot which the policeman was happy to pose for. 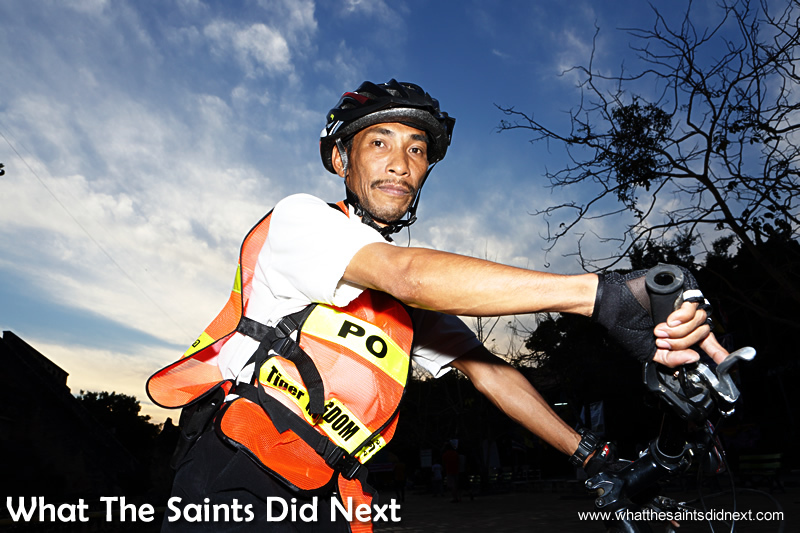 Cycle policeman in Chiang Mai, Thailand, shot with a strobe from low for an imposing effect. But flash at the end of the day is personal choice. One of the best travel photographers I know never uses flash and his images are incredible. I hate that backup batteries are hardly used, but it’s a necessary evil for photographers; like insurance, you daren’t travel without it. Luckily both cameras use the same battery type, so we carried three in total, one in each camera and a floating spare. We rotated the batteries every time we did a charge. Flash batteries are a pain for weight vs actual use. But for model shoots on location like we’ve been doing, spares are vital. It would be silly to have coordinated a beautiful model in a beautiful city only to find you can’t light the shot. Sure, natural light is great, but strobes allow a far greater range of possibilities. Each flash needs 4 x AAs. Being old fashioned I wanted to have a spare set on hand for each unit, so in total we have been carrying 16 x AA batteries. During regular day trips I carry just one set in the flash and one set spare (so 8 total). 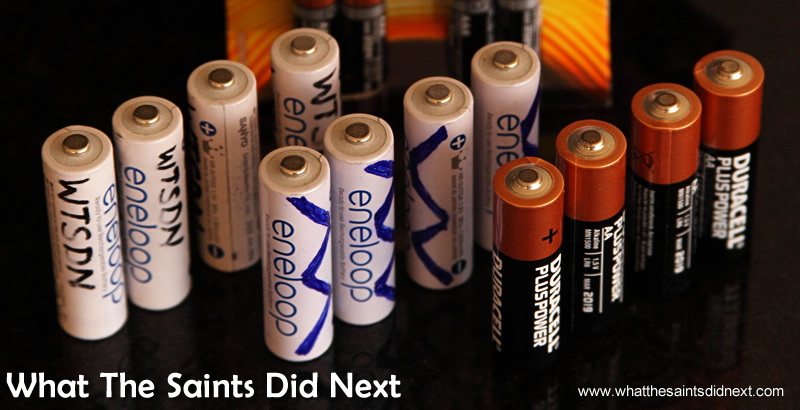 Some of the many batteries we lumped around – just in case! Did we ever need the spare batteries? Answer: No! Even on the street photo shoots each flash performed with just one set of batteries. But again, I don’t dare ruin a model shoot for the sake of 4 x AA batteries. In addition we carried 4 x AAA Duracells for the radio triggers, weight: 46g. Our compact camera goes everywhere with us. It’s super handy as it’s light, quick and easy to capture images very quickly and it can be carried in a pocket. The quality (16MP) is also good with the right lighting conditions. We regularly use the images right here on the blog and most times it would be difficult to tell which camera was used. Sharon shooting with the compact in Hanoi, Vietnam. Bee and Noi in the water at Thailand’s Mountain Float resort. Best of all, the compact is waterproof, which allows us to get swimming shots, take it kayaking and splash about in the rain. Effectiveness: Don’t leave home without it! This camera is fun. Ok, definitely not in most travel photographers’ kit bag, but essential for model shoots to get the flash operating from off camera. Luckily weight-wise these have little impact, they are very light. I use two Bowens Pulsars. Nearly 10 years old now, but working perfectly, so why change. The Bowens Pulsar radio trigger, mounted on the camera. The cameras use Compact Flash cards. I carry 3 x 8GB cards and 1 x 32 GB; total, 56GB. Generally on a day trip I only use two 8GB cards. Certain trips I’ll use three. On rare occasions when we are particularly busy, the 32GB card gets used, but this is mostly a safety card which is also high speed so suitable for video. 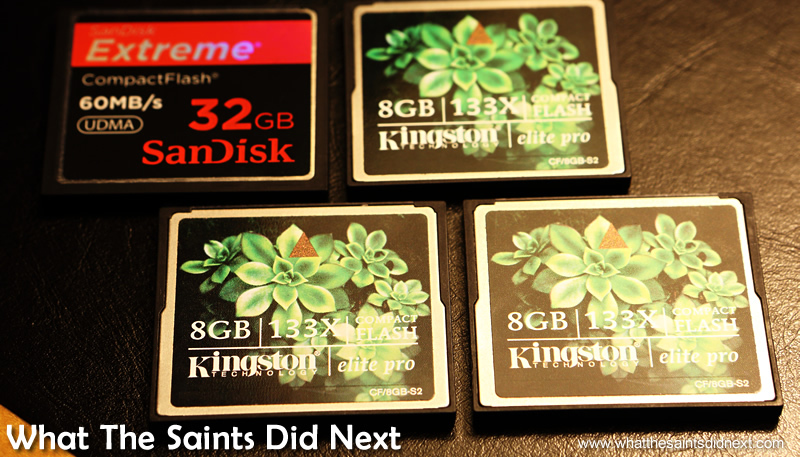 Compact flash memory cards for the Canon cameras. As a rule I don’t leave images on the cards – they are downloaded each night and backed up to the hard drives. Effectiveness: Spot on, plenty of built in spare capacity. Two Toshiba, 1TB external hard drives, 0.18kg each, turned out to be plenty of storage and backup space for our six week trip. A ‘Primary’ and a ‘Secondary’ drive, protecting those precious images. 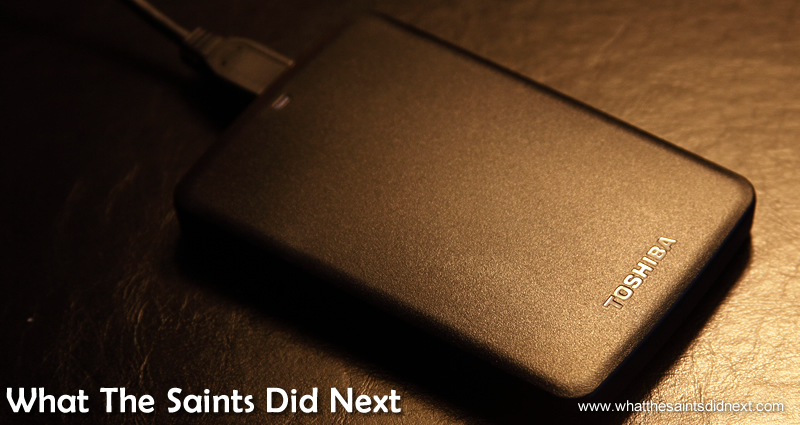 One of the two Toshiba, 1TB, external hard drives. Effectiveness: Spot on capacity. It would be easy enough though to buy another hard drive while travelling. 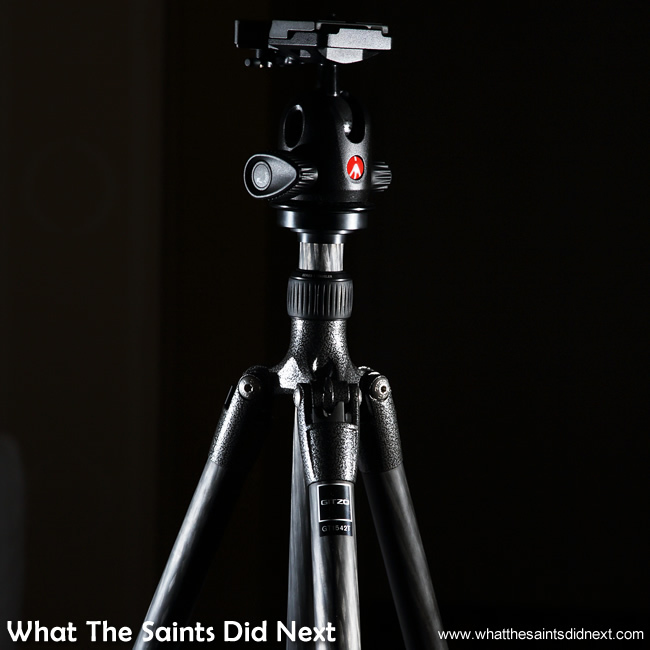 Do you really need a tripod? Again, this could be optional depending on various factors of the assignment, however, I knew I wanted to shoot night shots with long exposures which meant a tripod was essential. It also doubles as a light stand to hold a flash unit. The tripod with head mounted. A 25sec exposure in Bangkok, Thailand. Could only do this with the tripod. Over the years I’ve acquired a few tripods; heavier ones for video work. For this trip I took our lightest model, the carbon fibre, Gitzo GT1542T Traveler Series 1 4-Section 6X Tripod with G-Lock , which only weighed 1kg. The Manfrotto 496RC2 head for the tripod weighed quite a bit. Sometimes I would carry this in my carry on luggage. Weight, 0.42kg. Effectiveness: Yes, definitely worth the extra weight. 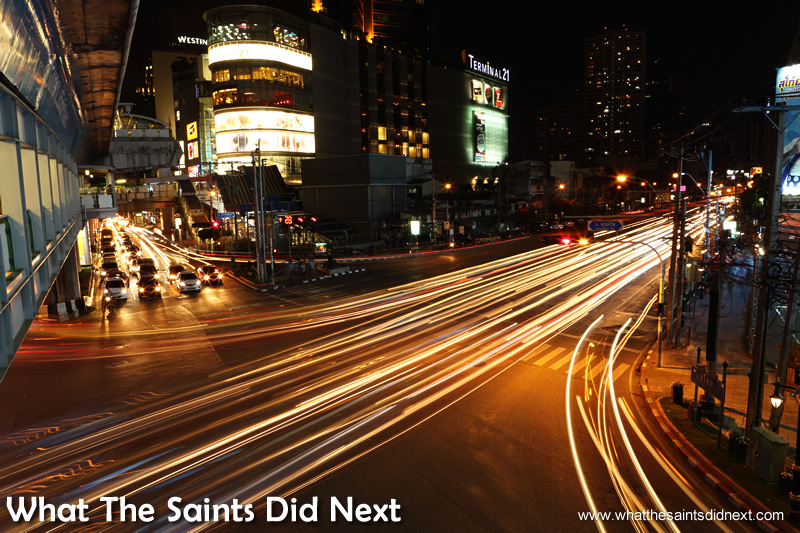 We got some great night shots of Bangkok, Phnom Penh and Hanoi. I also used the tripod a lot during model shoots for stability with the 70-200mm lens. My laptop is five years old and a newer one would probably be lighter, however, I take good care of my kit and love that even now the laptop works great. Toshiba Satellite Pro C660-1V0, 320GB hard drive. Five years old. Weight, 2.54kg. 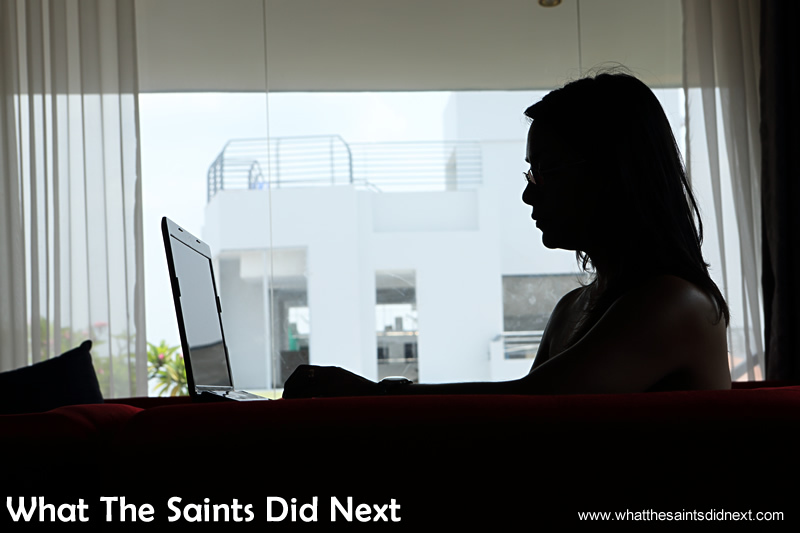 Sharon using her own laptop, writing a blog piece in the hotel in Phnom Penh, Cambodia. Effectiveness: Worked great the whole trip. Used to edit pictures, write blog articles, update the blog and Facebook, communications (email, Skype) and internet access. I took lens cleaner and cloth but also Pec Pads and paddles for cleaning the camera sensor, not something recommended to try at home. 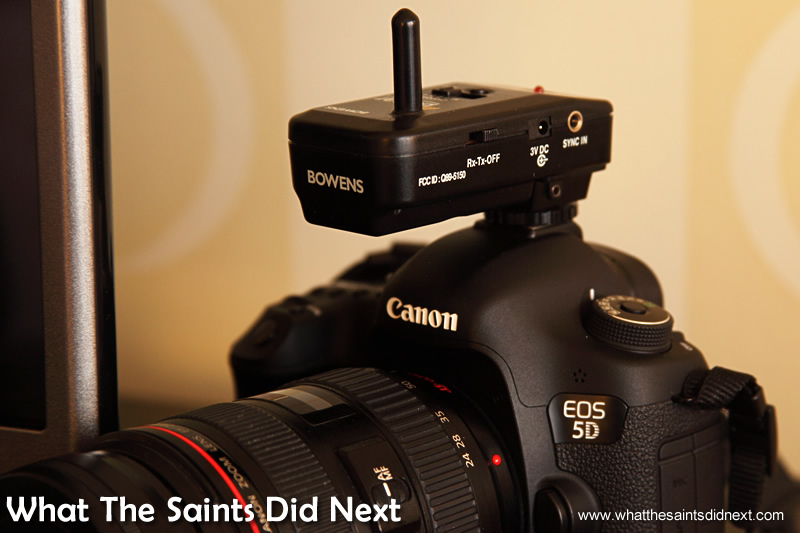 However, living on St Helena where it’s not so easy to pop in to a Canon store, I learned to clean my own sensor a few years ago, something that now comes in very useful and saves on expensive service costs. 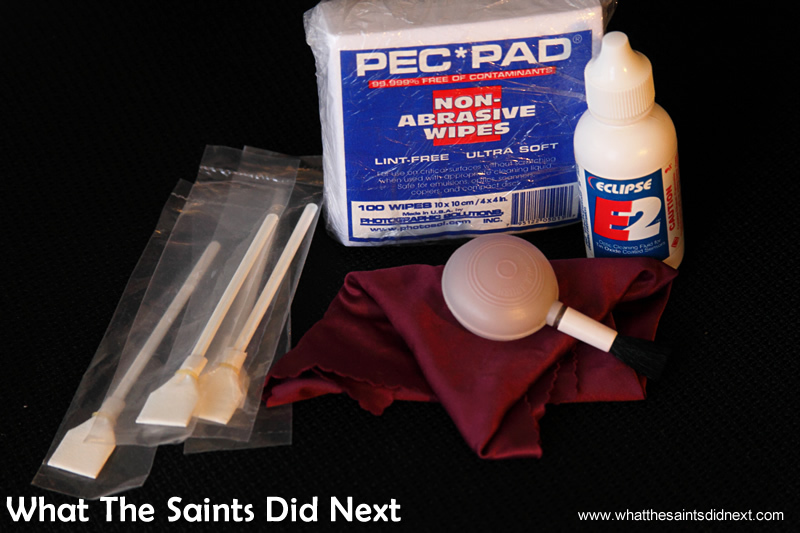 Sensor and lens cleaning kits. Effectiveness: Although I used the lens cleaner every day, I never had cause to clean the sensor. But again, I wouldn’t travel that far without it. There are always some bits and pieces you just have to have. USB cables for downloading to the laptop and backups. I’ve found card readers to be unreliable over the years so now work directly from the camera. USB flash drives, or USB sticks as they are known. These have proved useful many times when sharing pictures with people we’ve met. Filters – the lenses all have filters fitted for protection mostly, plus I carry 3 extras including different NDs. 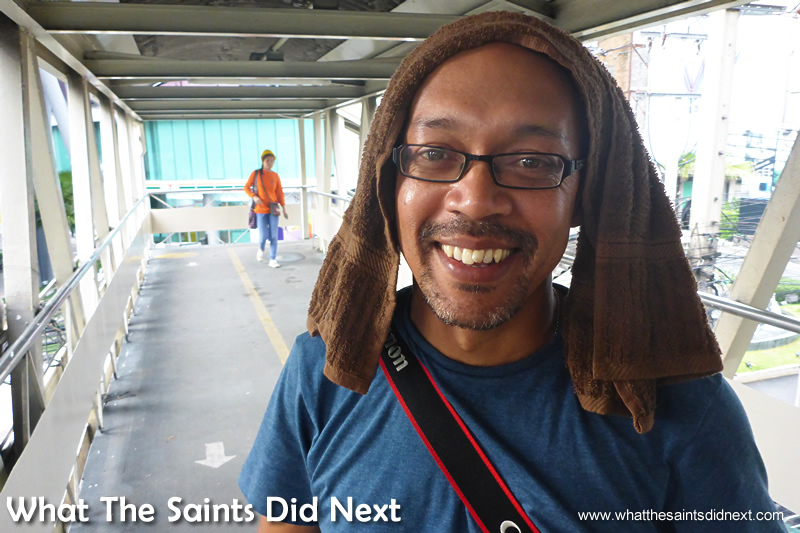 Shooting in Southeast Asia’s muggy heat and carrying heavy gear, meant I needed another piece of kit – a towel. Picked this up from the home ware section of a large Tesco Lotus supermarket in Bangkok. It has been a lifesaver on so many occasions since. Couldn’t go anywhere without my towel afterwards! The compact mounted on top of the bean bag, another important item in the bag. The Pod bean bag . This handy item I bought seven years ago and it’s always in my camera bag. It screws into the bottom of the camera and provides great stability for slow shutter speeds or to prop the camera up for a timed selfie. Business cards, a pen and a notepad. Seem to need these every day. Masking tape. This is included mainly for model shoots but it’s amazing how often a small roll of masking tape comes in handy. I have two bags. My small ‘mobile’ backpack for everyday use which holds one camera, two lenses and a flash unit. This bag is emptied and goes in the suitcase when we fly. I love this backpack as I got it for free nearly 10 years ago when a shopkeeper in Tottenham Court Road, London, was trying to convince me to buy a camera. Best value! A peep inside the smaller mobile backpack. My big kit bag is used for travel and also fits in overhead lockers on planes. 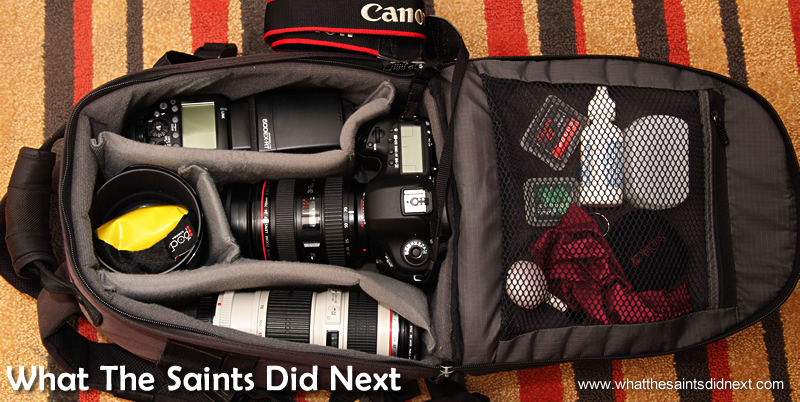 It can be worn as a rucksack and can also take the laptop, as well as all the camera kit. It also has outer mesh pockets and straps that allow the tripod to be attached if necessary. So there it is, the kit I packed for my first travel photography adventure. Fully loaded in the big bag, the total weight is around 11kg. Working on another street shoot in Bangkok. Check out ‘Photoshoots’ on the blog categories to see them all. Would love to hear feedback on this article or your own travel photography tips, after all, my list of priority items is sure to be completely different to yours. What is essential for you to shoot awesome travel pictures? Forgot to mention at the time this blog was issued but thank you for your advice. Even for an amateur such as me the blog contained Invaluable tips. I do enjoy all, your photography you show on your site which I might add I envy – it is superb. and am sure can learn a lot from you in this regard. We are travelling to Euroope in Spring -Sept 2015 and will be so pleased if you will perhaps put an article on your web site how to tke a good piucture witgh an ordinary Canaon camera. .
You took such a splendid photo of the wife and I in Jamestown St H. a couple of years ago and we still have it to-day on my photo albums . In fact a lot of your scenes shown on this site I have down loaded for my own benefit just to show the family what the Saints did.